I just hate it when I break a dish especially one of my brightly colored pieces of Harlequin or Fiestaware. It is even difficult for me to throw the broken pieces away. I’ve seen where some people have broken dishes up into ’tiles’ and set them into interesting designs. 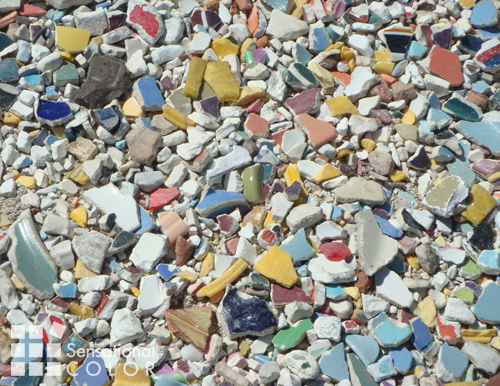 I know that is not going to happen at my house so I frown as the colorful shards go the way of the recycling bin. Finally a solution! While I was walking down Commercial St. in Provincetown, MA I noticed that several homeowners and at least one business owner have replaced the gravel or broken shells typically used for driveways or walking paths with broken dinnerware. To recycle dishes this way seemed unusual so I just had to ask around. No one seemed to know how or when this got started but now everything from the chipped dinnerware of local restaurants to ceramic sinks from home renovations is brought to a corner of a local parking lot. Anyone can take what they need or just simply work off steam by breaking the recycle dish pile into small pieces. While I don’t have a gravel driveway there are a few places in my garden where I could replace stones or gravel with colorful broken pottery. With even just one dish I could mix the pieces in with the gravel that covers the soil in my herb pots to add some flecks of color. If you happen to be in Provincetown you can see how this looks for yourself. 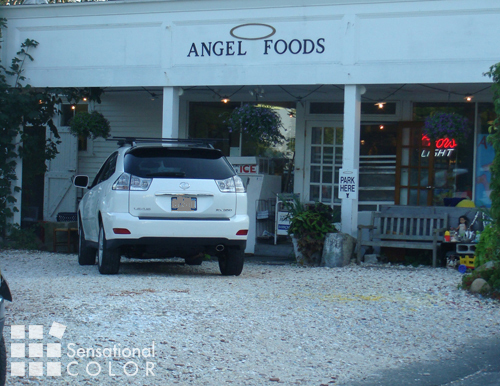 The small parking lot at Angel Foods on Commercial St. is where I took these pictures. While I’ll never be happy about breaking one of my beloved colored plates or bowls I do like the idea that they can take on a new life by being recycled right in my own backyard. How do you recycle dishes? 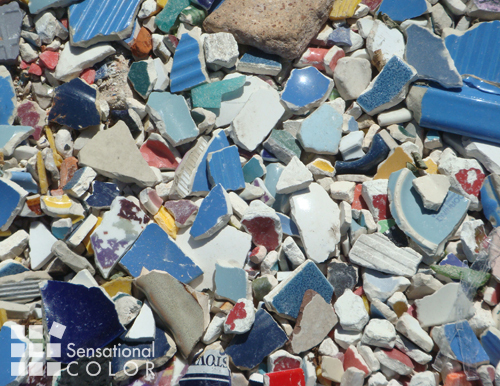 Do you have any other ideas for how you could use these colorful shards of pottery? I absolutely love the idea of recycling plates this way. Fantastic. We think alike Kathleen. Thanks for stopping by. Living in Thailand. I just finish my villa in Hua Hin and search some inspiration for my villa. Thanks for stopping by Gunnar. I hope you find just the inspiration you are looking for. For small projects or when planning for larger one to use the broken dishes as tiles, watch yard sales and thrift stores and the discount Dollar Stores and Greentree. You can pick up bright colored plates for as little .59 at a thrift store. I plan to paint my kitchen light yellow, I found a canister set with bright fruit & purple grapes on it, then remembered I had a piece of beautiful fabric with grapes, it has the same yellow as I plan my walls. At our local thrift store last month I found 3 dinner plates and 2 salad plates with bright fruit & you guessed it; Purple grapes. I have the perfect place over the opening between the kitchen to hang the plates as art. I just had to get the fat bellied pitcher in aged yellow with purple grapes! I think it will find it’s home in the center of the island. I have 4 grown daughters who can’t decide if I am senile or just crazy, whoever heard of yellow and purple as the color scheme for a kitchen? Great ideas, Jean. Thanks for sharing. I love the idea of purple and yellow for your kitchen and would love to see pictures when you are done. The purple/yellow combination is one that is very nurturing and healing and as a mom of four grown daughters I’m sure you’ve done your share of both. 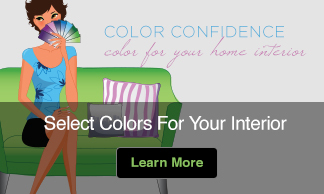 The plates, canister set and fabric all sound like they will pull the two colors together beautifully in your kitchen. Just because it isn’t a common scheme doesn’t mean it isn’t right or won’t be gorgeous. Go with it! How brilliant – a recycled drive way and a kinetic mosaic all in one – great idea! This is fantastic! 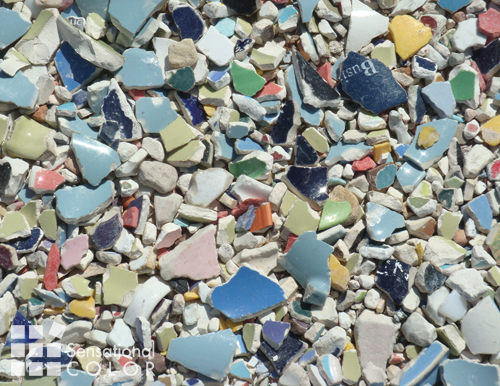 Recycling AND color incorporation, all in one. I wonder how much “gravel” you need to have before you can scatter it in your driveway (or walkway?) Really terrific idea. Thanks for the great post! I think this is beautiful & A great way to use dishes. 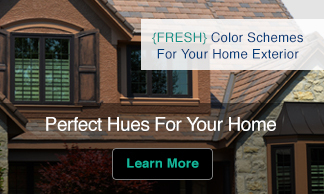 But… what about the sharp corners? + car tires, isn’t there a risk here? Hi, I think it’s a great idea, but I’m also concerned about sharp edges. I have kids who go barefoot and an active dog- and what about neighbors? I’m a potter, so I have seconds that I smash- it would be great to be able to use them in a garden, but I am concerned. Great idea! Maybe you can solve the problem with sharp corners simply adding glue or white concrete…I presume you can create something like tiles. I was wondering about that too but it didn’t seem to be a problem but maybe because they had been driven over for sometime and the edges were worn down. But if it was I think you are on the right track with making them into tiles or surrounding with another material. I loved this article, because it bothers me to throw away the pieces of my favorite blue and white dishes. 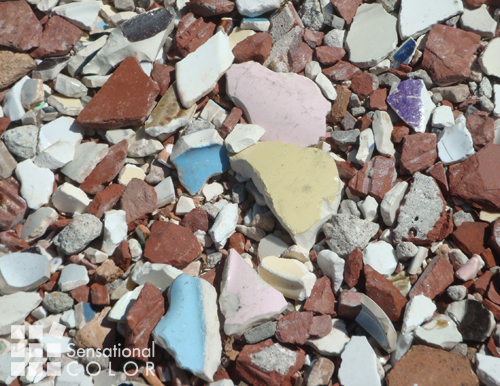 A great girl scout or even boy scout project is to make concrete stepping stones embedded with shards of colorful broken pottery, another way to recycle things no longer used. Yes, I remember making stepping stones in Scouts with my son. It is a great way to recycle the pottery or dishes we love into something beautiful and useful.